Natural interior design elements can work beautifully in homes of every era and style. Whether it’s a tranquil zen refuge or a cozy, rustic cabin, the right pieces will make your space feel grounded, calm, and refreshing year round. How you choose to incorporate natural interior design in your home will depend on the specific look and feel you want to achieve. These tips and ideas are sure to spark your imagination. A material that is natural is not necessarily environmentally friendly (though many materials are both). If sustainability is important to you, you may also choose to look into eco-friendly materials. Many people who follow a vegan diet, prefer to follow a vegan approach to home design. Here are some great natural materials for floors, countertops, and more. As you make choices, stay true to your vision for your home. Natural wood options, for example, are nearly endless. Dark mahogany is strong and solid, while lighter wood lends a more carefree, airy feeling. Light is one of the easiest things to bring in from outside. If you’re remodeling, installing large windows, skylights, and glass doors are a great way to do this. 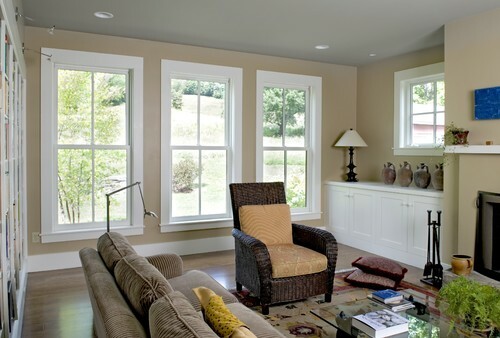 It’s important to think about details such as the orientation of your windows, in order to balance the amount and distribution of light coming into your home. If you’re just refreshing your home rather than fully remodeling, you can still work with what you have to maximize natural light. Choose flowy curtains that are easy to pull back. Use light colors (which reflect light) in your interior decorating, especially when it comes to wall colors and window sill trim. Fresh air can make your home feel so much more natural as well. Consider installing screens on your windows so you can leave several of them open to create cross-ventilation when the weather is good. For months with harsher weather, you might want to install a good ventilation system for your heating and/or cooling systems. There’s no better way to invite nature indoors. Researchers have linked the presence of green leafy indoor plants to improved mood, suggesting they can make us less stressed, boost our creative thinking abilities, and even help us get along better with others. Artificial plants appear to offer similar psychological benefits when we look at them, but because they don’t smell as nice, they’re not your best bet if you’re looking for pleasant and calming aromas in your home. Regardless of research, it’s important to choose plants that you love and that compliment the rest of your home. Fresh flowers and green leaves look great in practically any room, no matter the style. Bamboo offers a tranquil, zen vibe. Succulents and cacti are great low-maintenance options. Natural design, much like any design style, is more about a unified feeling than merely an aesthetic. We would love to work with you to create that perfect atmosphere you’re imagining for your home. If you’d like help with solidifying your vision, sourcing hard-to-find materials, or any other aspect of the design process, Karen Linder Interior Design can help.